This revolutionary blush combines all the best features of baked, powder, and cream formulas, releasing perfect color and a texture that lays on cheeks like a second skin. Easily blendable and buildable without being powdery, this unique blush leaves an unbelievably polished finish. The warm shade, Apricot Brandy, was inspired by the Color of the Year, Tangerine Tango, and will light up the apples of your cheeks with a spirited glow. 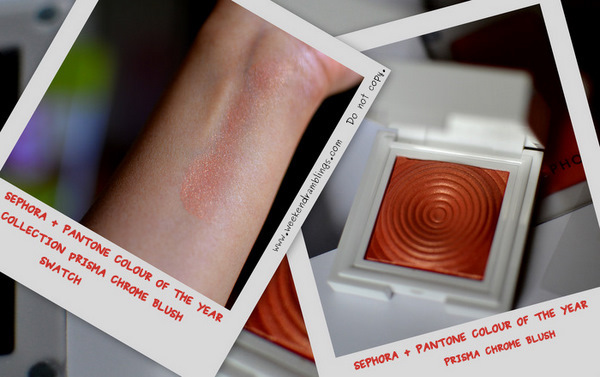 Sephora has put in a lot of thought into the packaging of the design of this entire range, and the Sephora + Pantone Prisma Chrome blush in Apricot Brandy is no exception. The packaging is a classy white case with a mirror that's handy for quick touch-ups. The blush is baked into a swirl pattern and is a burnt orange colour - an effect that is perhaps helped along by the frosty, shimmery finish. This is a very pigmented blush that is best applied with the lightest hand. It has a velvety creamy feel to it, and I find it supereasy to apply with just my fingers. Blend it out with a brush to get a neater application. This also one "glowy" blush with a liberal amount of shimmer in the blush, and I am no shimmer fan, but to be fair, the particles somehow stay put and don't tend to wander about on my face. which cam do you use Rads.. Thank you :D ...really wonder why they loaded up on the shimmer so much..